Top Left Design featured on the Kensington and Chelsea Times magazine! I was privileged to be asked to write a small article for the Kensington and Chelsea Times. We also placed an ad which was displayed next to the article. We will shortly be posting a blog version of the article – but I wanted to quickly post this to show you how we had our words in print! Update: Read the entire article we placed! 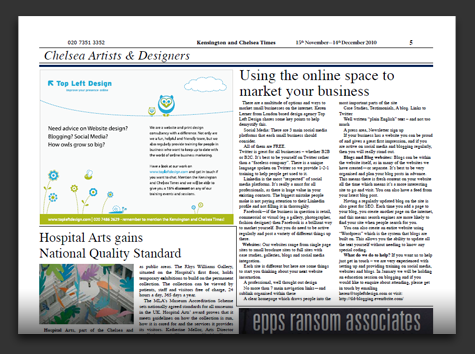 Tagged in About Social Media / Digital Marketing, Kensington and Chelsea Times, TLD in the Press!